Please cite this webpage as: http://www.musiccognition.nl/newborns/ -- Mirror website in Hungarian. Paper - What is the research about? Stimuli - What did the newborns listen too? 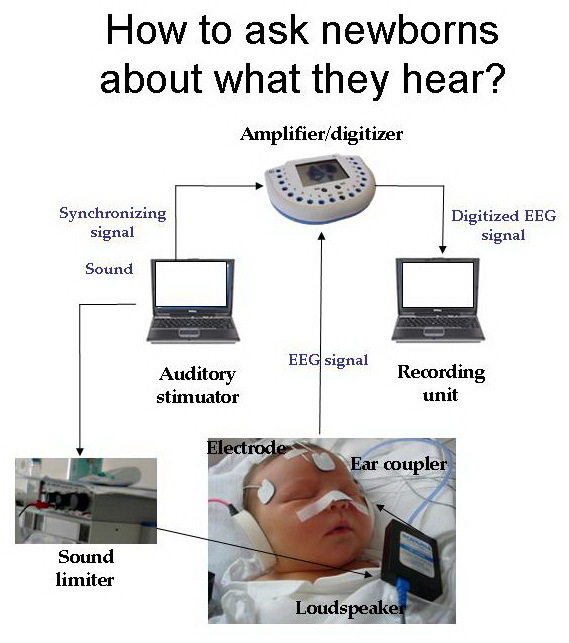 Method - How to ask newborns about what they hear? Videos - What is beat induction? N.B. All material on this site is in the public domain. 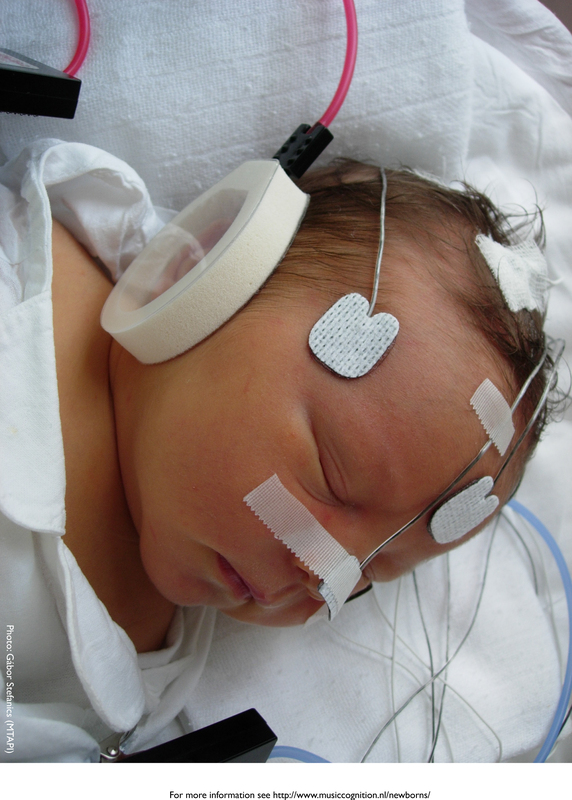 Researchers have found that newborn infants are able to detect the beat in music. The results support the theory that a sense for detecting a regular beat, termed ‘beat induction’, is innate or possibly learned already in the womb. Beat induction is probably fundamental to the origins of music, because it allows clapping or making music together, dancing to a rhythm, etc. István Winkler, Henkjan Honing and colleagues investigated beat induction in sleeping babies two or three days after birth. 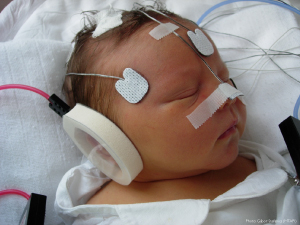 Since it is not feasible to observe behavioral reactions in newborns, the researchers used scalp electrodes to measure electrical brain signals. The babies wore self-adhesive ear‑couplers (see photo) through which a simple, regular rock rhythm was delivered, consisting of hi-hat, snare, and bass drum. Several variants of the basic rhythm were constructed by omitting strokes on non-significant positions of the rhythm. These variants were played to the infants, with a “deviant” segment, missing the downbeat, occasionally interspersed. Shortly after each deviant segment began, the babies’ brains produced an electrical response marking that they had expected to hear the downbeat but had not. This innate sense of rhythm is probably essential for bootstrapping verbal communication and music appreciation, the researchers say. The research was conducted at the Institute for Psychology of the Hungarian Academy of Sciences and the Cognitive Science Center Amsterdam at the University of Amsterdam within the EmCAP (Emergent Cognition through Active Perception) collaborative project funded by the European Commission’s 6th Framework Programme for ‘‘Information Society Technologies’’ (contract no. : 013123). István Winkler (auditory perception and its measurement in neonates), Institute for Psychology, Hungarian Academy of Sciences, Budapest, HUNGARY; tel: +36-1-3542296; e-mail. Henkjan Honing (music perception and cognition), Institute for Logic, Language and Computation, University of Amsterdam, NETHERLANDS; tel: +31-20-4206589; e-mail. In order to understand how humans can learn to understand music, we need to discover what perceptual capabilities infants are born with. Beat induction, the detection of a regular pulse in an auditory signal, is considered a fundamental human trait that, arguably, played a decisive role in the origin of music. Theorists are divided on the issue whether this ability is innate or learned. We show that newborn infants develop expectation for the onset of rhythmic cycles (the downbeat), even when it is not marked by stress or other distinguishing spectral features. Omitting the downbeat elicits brain activity associated with violating sensory expectations. Thus our results strongly support the view that beat perception is innate. Photo (and video below) courtesy of Gábor Stefanics (MTAPI). Caption: Sleeping newborn infant participating in the experiment. The rock rhythm was delivered to the baby through self-adhesive ear-couplers at a low volume while electrical brain activity was measured with electrodes attached to the scalp and the face. Measurements followed feeding and lasted for about 20 minutes. The mother of the baby was present during the procedure. This research was realized in the context of EmCAP (Emergent Cognition through Active Perception), a research project in the field of Music Cognition funded by the European Commission (FP6-IST, contract 013123). The authors thank János Rigó for supporting the study of neonates at the First Department of Obstetrics and Gynecology, Semmelweis University, Budapest. We also thank Erika Józsa Váradiné and Zsuzsanna D'Albini for collecting the neonate and adult ERP data, respectively and to Martin Coath and Glenn Schellenberg for their comments on earlier versions of the manuscript. For more information on the Hungarian research group lead by István Winkler (auditory perception and its measurement in neonates) see here. For more information on the Dutch research group lead by Henkjan Honing (music perception and cognition) see here. Beat induction (i.e., detecting a regular pulse in an auditory signal; referred to as tactus in music theory) is considered a fundamental human trait that, arguably, played a decisive role in the origin of music, because sensing beat allows synchronization between individuals, such as in dancing and producing music together. In this study, we asked the question whether newborn infants detect the beat of a sequence composed by stringing together several exemplars of a typical rock drum accompaniment pattern composed of snare, bass and hihat sounds (see the animated cartoon). Four non-syncopated variants of this pattern were composed, one having a sound on all eight equally spaced positions and three further by omitting sounds at different, metrically non salient positions. These four strictly metric variants made up altogether 90% of the patterns in the sequence. A strongly syncopated variant was delivered in 10% of the time. This pattern omitted the first sound (the downbeat), causing adults to perceive it as if the rhythm broke, stumbled, or got strongly syncopated for a moment. The electrical brain responses (see the "Recoding Electrical Brain Responses to Sounds" and the "Experimental Procedures for Recoding Electrical Brain Responses from Sleeping Newborns" sections here) illustrated on the animated cartoon show that the babies processed the infrequent omissions of the downbeat differently from omissions that did not break the regular rhythm. Thus it appears that detecting the beat of a rhythmic sound sequence is part of the auditory processing capabilities which are already functional at birth. Our results show that the newborn auditory system is sensitive to periodicities and develops expectations about when a new cycle should start (i.e., when the downbeat should occur). Sensing the beat is not only a necessary for music perception; it is also needed for adapting communication to partners or situations with different speech rhythms by, e.g., finding the right time for when to answer or when to interject. This and other similar high level auditory processing capabilities found in neonates (see e.g., the other sections) show how well prepared we are for music and speech at birth. Video 1: What is beat induction? Video 2: How is it to be born into a musical world? Video 3: Beat induction and 'listening' machines? on how it is to be born into a musical world. [in Dutch only] Fragment uit Spinozadebatlezing over het luisterexperiment met pasgeboren baby's (Bron: Spinozadebat gemist).